Wouldn’t it be nice if we all could live in houses that people would pay money to take a tour of? If anyone took a tour of my house it would go something like this—“On the left you will see the bags of recycling that need to be taken to the bin in the garage and on the floor you will find countless toys. Please watch your step.” Also I think I would have to pay someone to take a tour of my house, not vice versa. Tom and Mary agree to open Downton to the public for one day to raise money for the hospital. Of course they are clueless as to how to go about doing this and it’s up to Edith’s boyfriend to tell them they need to break people up into groups, have a member of staff in each room and have members of the family available to provide information. The whole thing is very successful and Tom wonders if they shouldn’t keep offering tours to raise money for themselves. Cora gets word that, not only is the hospital going to merge with the one in York but they want Violet out as President—and Cora in. The new board does not want someone who was against the merger in the first place to be in charge. Violet doesn’t know this and continues to think that the merge won’t happen. She promises to be “magnanimous in victory.” Violet finds out about her ousting right in the middle of the tour and, to everyone’s shock, causes quite the scene. “Please tell Cora I don’t wish to see her face until I get used to having a traitor in the family,” she tells Robert. Mr. Carson still isn’t pleased with Mrs. Hughes’ homemaking skills—from how she makes the bed, to what she cooks for dinner. I don’t think this storyline is necessarily on track with how thrilled Mr. Carson was to marry Mrs. Hughes. It seems more like a storyline Julian Fellowes knew he could have a lot of fun with, and is absolutely being played for comic relief. 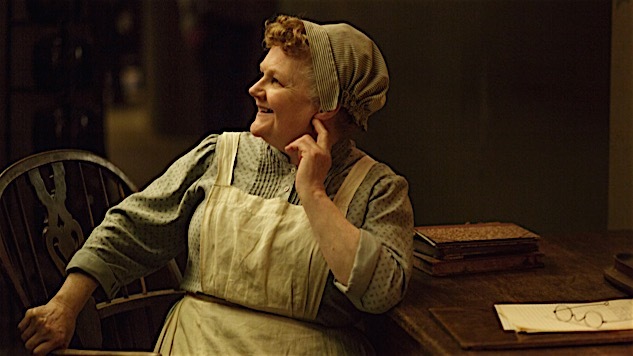 Mr. Mason is still romancing Mrs. Patmore, much to Daisy’s chagrin. I hope that Daisy softens a bit before the show ends. The constant sneer on her face is getting beyond tiresome. The most heartbreaking moment came with Thomas, who Mr. Carson and Robert are both eager to have find new employment. Thomas is helping Andy learn to read, but both Mrs. Patmore and Mr. Carson fear that something untoward might be going on—that Thomas is taking advantage of Andy. Thomas won’t betray Andy’s secret but promises Mr. Carson that nothing is going on. “How long do I have to work in this place before I get any credit?” he asks Mr. Carson. The final image is one of him sobbing. It’s a tribute to Rob James-Collier’s nuanced performance that he has so fully humanized Thomas. He’s always been more than a one-note villain and his grief is now palpable. I can get really frustrated with the Bates and Anna storyline, but when he told Mary that they were in “shouting distance to our greatest happiness,” I definitely welled up. Mary is a bright woman, so how has she not figured out the truth about Marigold by this point? Poor Edith. Not even her own parents think she is a good romantic catch.